Solar power is more than just giant panels on the roof of homes. It can be used to power everything from cell phones to golf carts, too. 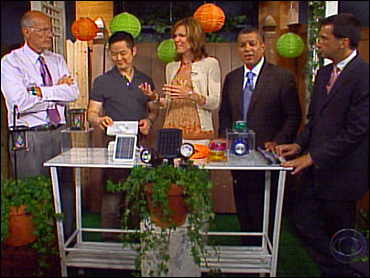 On Wednesday's The Early Show environmental lifestyle contributor Danny Seo(www.dannyseo.com)(http://dannyseo.typepad.com) took a look at outdoor solar lighting and accessories in Part Two of his three-part series on solar energy. The advantage of going solar with lighting, Seo said, is that these accessories have no special electrical wiring. You can basically put any type of light in any type of spot, and as long as the spot is sunny, installation of these accessories is quick and easy — with no electrical costs to power them up. Outdoor solar lights are commonplace and for sale in national hardware and home improvement stores. While they come at different price points and styles, their functionality is pretty much the same. Outdoor solar landscaping lighting has experienced double-digit growth in sales over the past three years. It is expected to exceed $500 million in sales this year according to The Boston Globe. Traditional solar accent lighting: A higher price tag generally indicates a higher quality solar light, and vice versa. While many discount retail stores sell solar lighting packs at very low prices, the light output from these lights can disappoint. For the brightest, longest-lasting light, look for lights with wide solar panels, at a minimum two LED bulbs, and a cover on the bottom of the light so the light can reflect and be intensified. Solar lights can be used to line a pathway or illuminate an outdoor dinner table at the last minute. Use bird-feeder hooks and hang them in trees so they mimic the look of Japanese lanterns. LED-free solar lighting: Some solar powered lights use an alternative technology, different from the standard LED technology. Lowe's Regent Lighting Solar Motion Floodlight ($88, www.lowes.com) has a large solar panel for charging with a 15-watt halogen bulb. Because it's a motion detector, it automatically turns off during the day and turns on when it senses motion. This floodlight is a good choice for areas without electrical wiring that need additional security lighting. Bright lights: Solar floodlights are also your best bet when you need bright accent lighting that will focus the light source on a very specific area. The only downside is the set of lights comes with a large solar panel, which needs to be mounted in full sun to charge up the power lights — it can be unsightly. A floodlight is the perfect choice to illuminate the sides of a home, use in a garden or to focus on a very specific area in the yard. Installation is easy — you just stake the light directly into the ground. Stylish and unusual lights: As solar lighting gains mainstream popularity, design has also evolved. Companies like Gardener's Supply are offering lights inspired by rice paper Japanese Shoji lanterns. These colorful, round lights are made from weather-resistant nylon and come in bright colors like orange and green. These are perfect for summer entertaining; they can be hung above an outdoor table or in trees. The lights are also collapsible for easy storage when you're not entertaining outdoors. Bubbling fountains: Because birds are more attracted to moving water than still water, a bubbling bird bath is the way to go. A solar-powered birdbath makes sense since you won't need wiring, cords or transformers to power it. And since it only sprays water when it's sunny, the bird bath will conserve battery power on rainy/cloudy days and at night.